Nobody needs to read Zbigniew Brzezinski’s “Grand Chessboard” 1997 opus to know US foreign policy revolves around one single overarching theme: prevent – by all means necessary – the emergence of a power, or powers, capable of constraining Washington’s unilateral swagger, not only in Eurasia but across the world. The Pentagon carries the same message embedded in newspeak: the Full Spectrum Dominance doctrine. Syria is leading all these assumptions to collapse like a house of cards. So no wonder in a Beltway under no visible chain of command – the Obama administration barely qualifies as lame duck – angst is the norm. The Pentagon is now engaged in a Vietnam-style escalation of boots on the ground across “Syraq”. 50 commandos are already in northern Syria “advising” the YPG Syrian Kurds as well as a few “moderate” Sunnis. Translation: telling them what Washington wants them to do. The official White House spin is that these commandos “support local forces” (Obama’s words) in cutting off supply lines leading to the fake “Caliphate” capital, Raqqa. Another 200 Special Forces sent to Iraq will soon follow, allegedly to “engage in direct combat” against the leadership of ISIS/ISIL/Daesh, which is now ensconced in Mosul. These developments, billed as “efforts” to “partially re-engage in Iraq and Syria” are leading US Think Tankland to pen hilarious reports in search of “the perfect balance between wide-scale invasion and complete disengagement” – when everyone knows Washington will never disengage from the Middle East’s strategic oil wealth. All these American boots on the ground in theory should be coordinating, soon, with a new, spectacularly surrealist 34-country “Islamic” coalition (Iran was not invited), set up to fight ISIS/ISIL/Daesh by no less than the ideological matrix of all strands of Salafi-jihadism: Wahhabi Saudi Arabia. Syria is now Coalition Central. There are at least four; the “4+1” (Russia, Syria, Iran, Iraq plus Hezbollah), which is actually fighting Daesh; the US-led coalition, a sort of mini NATO-GCC combo, but with the GCC doing nothing; the Russia-France direct military collaboration; and the new Saudi-led “Islamic” charade. They are pitted against an astonishing number of Salafi-jhadi coalitions and alliances of convenience that last from a few months to a few hours. And then there’s Turkey, which under Sultan Erdogan plays a vicious double game. “Tense” does not even begin to describe the current Russia-Turkey geopolitical tension, which shows no sign of abating. The Empire of Chaos lavishly profits from it as a privileged spectator; as long as the tension lasts, prospects of Eurasia integration are hampered. Russian intel has certainly played all possible scenarios involving a NATO Turkish army on the Turkish-Syrian border as well as the possibility of Ankara closing the Bosphorus and the Dardanelles for the Russian “Syria Express”. Erdogan may not be foolish enough to offer Russia yet another casus belli. But Moscow is taking no chances. Russia has placed ships and submarines capable of launching nuclear missiles in case Turkey under the cover of NATO decides to strike out against the Russian position. President Putin has been clear; Russia will use nuclear weapons if necessary if conventional forces are threatened. If Ankara opts for a suicide mission of knocking out yet another Su-24, or Su-34, Russia will simply clear the airspace all across the border via the S-400s. If Ankara under the cover of NATO responds by launching the Turkish Army on Russian positions, Russia will use nuclear missiles, drawing NATO into war not only in Syria but potentially also in Europe. And this would include using nuclear missiles to keep Russian strategic use of the Bosphorus open. That’s how we can draw a parallel of Syria today as the equivalent of Sarajevo 1914. Since mid-2014 the Pentagon has run all manner of war games – as many as 16 times, under different scenarios – pitting NATO against Russia. All scenarios were favorable to NATO. All simulations yielded the same victor: Russia. And that’s why Erdogan’s erratic behavior actually terrifies quite a few real players from Washington to Brussels. The Pentagon is very much aware of the tremendous heavy metal Russia may unleash if provoked to the limit by someone like Erdogan. Let’s roll out an abridged list. Russia can use the mighty SS-18 – which NATO codenames “Satan”; each “Satan” carries 10 warheads, with a yield of 750 to 1000 kilotons each, enough to destroy an area the size of New York state. The Topol M ICBM is the world’s fastest missile at 21 Mach (16,000 miles an hour); against it, there’s no defense. Launched from Moscow, it hits New York City in 18 minutes, and L.A. in 22.8 minutes. Russian submarines – as well as Chinese submarines – are able to launch offshore the US, striking coastal targets within a minute. Chinese submarines have surfaced next to US aircraft carriers undetected, and Russian submarines can do the same. 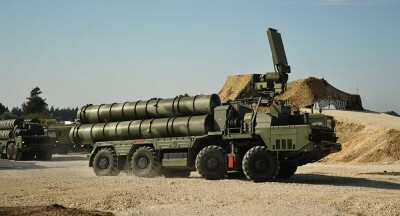 The S-500 makes the Patriot missile look like a V-2 from WWII. Here, a former adviser to the US Chief of Naval Operations essentially goes on the record saying the whole US missile defense apparatus is worthless. Russia has a supersonic bomber fleet of Tupolev Tu-160s; they can take off from airbases deep in the heart of Russia, fly over the North Pole, launch nuclear-tipped cruise missiles from safe distances over the Atlantic, and return home to watch the whole thing on TV. Russia can cripple virtually every forward NATO base with tactical – or battlefield – small-yield nuclear weapons. It’s not by accident that Russia over the past few months tested NATO response times in multiple occasions. The Iskander missile travels at seven times the speed of sound with a range of 400 km. It’s deadly to airfields, logistics points and other stationary infrastructure along a broad war theatre, for instance in southern Turkey. NATO would need to knock out all these Iskanders. But then they would need to face the S-400s – or, worse, S-500s — which Russia can layer in defense zones in nearly every conceivable theater of war. Positioning the S-400s in Kaliningrad, for instance, would cripple all NATO air operations deep inside Europe. And presiding over military decisions, Russia privileges the use of Reflexive Control (RC). This is a tactic that aims to convey selected information to the enemy that forces him into making self-defeating decisions; a sort of virus influencing and controlling his decision-making process. Russia uses RC tactically, strategically and geopolitically. A young Vladimir Putin learned all there is to know about RC at the 401st KGB School and further on in his career as a KGB/FSB officer. All right, Erdogan and NATO; do you still wanna go to war?